[Satnews] Two telecommunications satellites that will provide expanded relay capacity for Australia and Argentina were orbited on September 30 for Arianespace’s ninth mission in 2015—this places the company on track to perform a record 12 flights this year using its three-member launch vehicle family, which consists of the heavy-lift Ariane 5, medium-lift Soyuz and lightweight Vega. The launch by an Arianespace Ariane 5 of flight VA226. Lifting off exactly on time during a daylight departure from the Spaceport in French Guiana, the heavy-lift Ariane 5 used for today’s mission deployed the Sky Muster and ARSAT-2 satellite passengers during a 32-minute flight sequence. 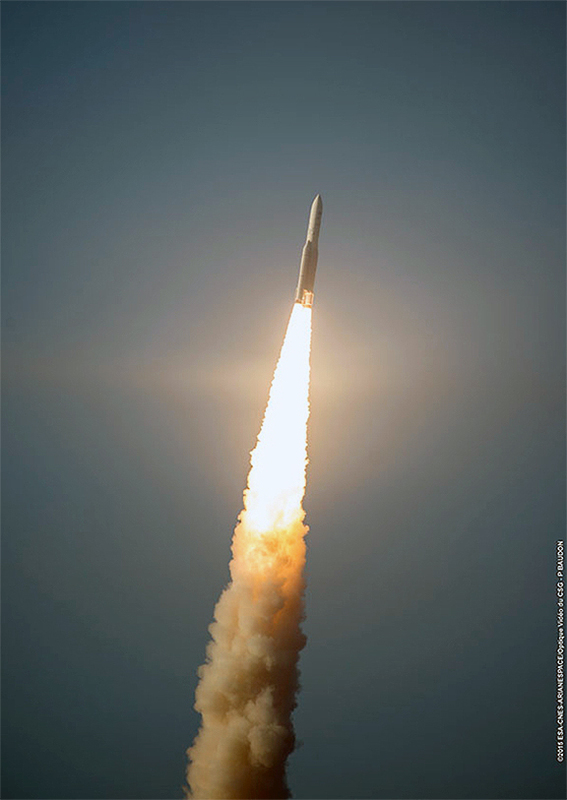 This launch marked the 82nd mission overall using Arianespace’s workhorse launcher, as well as the 68th consecutive Ariane 5 success. Photo is courtesy of SSL. 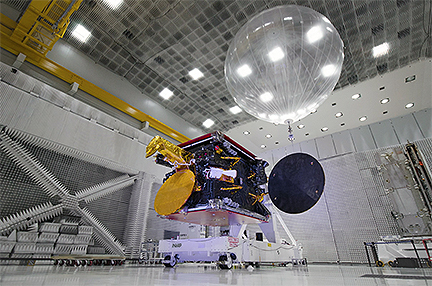 The first-released passenger on this mission was Sky Muster, which is the initial satellite to be operated by nbn, a service provider owned by the Commonwealth of Australia. This company’s objective is to ensure all Australians have access to fast broadband as soon as possible, at affordable prices and at the least cost to taxpayers. 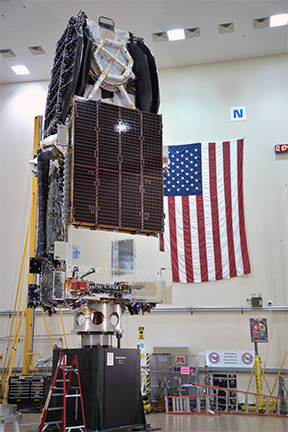 Built by Palo Alto-based SSL (Space Systems Loral), Sky Muster is scheduled to operate from geostationary orbit. Sky Muster is designed to deliver broadband services to more than 200,000 rural and remote Australians, providing coverage to the entire country— including the Norfolk, Christmas, Macquarie and Cocos islands. 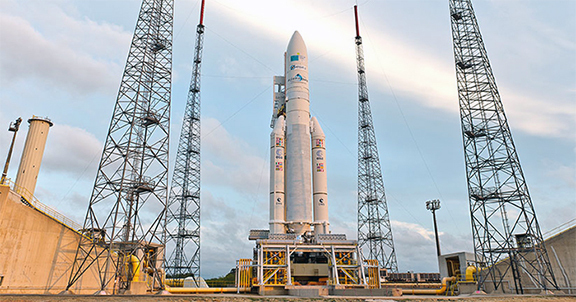 Launch of nbn’s second spacecraft has also been entrusted to Arianespace. Arianespace Ariane5 on launch pad awaiting liftoff. 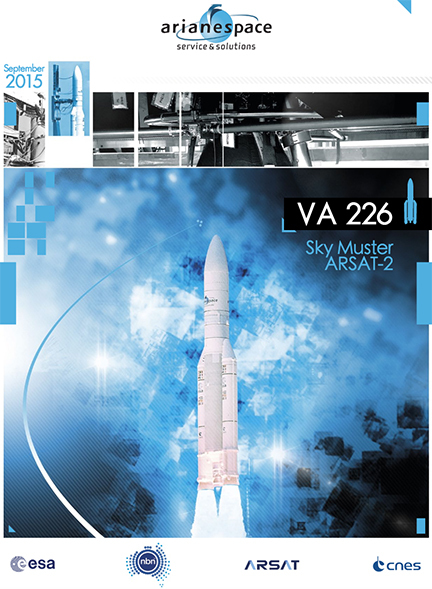 Completing Arianespace' VA226 mission was the deployment of ARSAT-2, which is the second of three geostationary satellites that will increase Argentina’s telecommunications capacity and guarantee the same level of connectivity quality across the country’s regions. 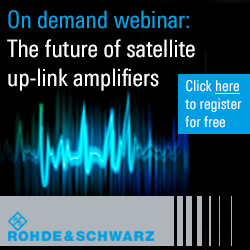 Arianespace successfully orbited the first of these relay platforms—ARSAT-1—on an Ariane 5 flight in October 2014. Built under the responsibility Argentina’s INVAP, ARSAT-2 will be operated by the state-owned Argentinian operator ARSAT (Empresa Argentina de Soluciones Satelitales Sociedad Anónima) to provide DTH television, Internet access services for reception on VSAT antennas as well as with data transmission and IP telephony. The ARSAT-2 satellite going through various ground tests in Argentina. Photo is courtesy of ARSAT. Arianespace will have the opportunity to go “three-for-three” after concluding a launch contract for the third ARSAT telecommunications satellite, ARSAT-3. Signed at the Spaceport just hours before Flight VA226, this agreement also includes options on two more missions. ARSAT Chairman and CEO Matias Bianchi, who spoke after the confirmation of today’s success, thanked Arianespace for another on-target mission, and added that ARSAT-3 is scheduled for launch from the Spaceport in 2019. - Perigee: 249.2 km. for a target of 249.5 km. - Apogee: 35,911 km. for a target of 35,927 km. Following this launch success, Arianespace’s mission pace will continue with two flights from the Spaceport, both of which are to be performed this November: a heavy-lift Ariane 5 launch with the Arabsat-6B and GSAT-15 payloads (Flight VA227); and a mission with the light-lift Vega carrying Europe’s LISA Pathfinder (Flight VV06). Regarding ARSAT-2, Arianespace’s Israel expressed his gratitude to both ARSAT and INVAP and offered a special word of thanks to the Argentinian government, which was represented at the Spaceport by Julio de Vido, Minister of Planning and Public Investment. Israël also confirmed that Arianespace was on pace for a record-setting operational performance this year (12 flights from the Spaceport in 12 months) and he also highlighted the company’s continued commitment to quality. Launch after launch, success after success, Arianespace demonstrates its capability to increase its launch rates while remaining the most reliable space transportation solution for all customers, whether commercial and institutional, whether GTO or non-GTO,” he said.